OK, the New York Police Department and the Barclays Center have a plan to manage the large (?) crowds expected for a non-ticketed June 11 event involving traditional Jews protesting apparent plans to expand the Israel draft to encompass more religious school students. Or, rather, they have a plan for a plan. At last night's 78th Precinct Community Council meeting, the commanding officer, Deputy Inspector Frank DiGiacomo, said that precinct officials will meet Monday with arena operators regarding plans for the 6 pm event. "We're going to tell them they cannot have buses" at the same level of the May 2015 event, a weekday memorial, that brought numerous religious students on buses that lingered in the neighborhood rather than wait, as planned, in a Red Hook staging area. "If they do have buses, they have to stage them," said DiGiacomo, indicating that buses violating the law will be ticketed (which didn't happen two years ago). "Nassau must be wary about plans for Coliseum," I wrote in Newsday 5/21/15, concluding, "Ratner revised the Brooklyn deal several times. Expect more in Nassau." At right is a photo of a poster spotted in Hasidic Williamsburg right. Clearly there's an event scheduled at the Barclays Center aimed at the Haredi Jewish community (strict Orthodox Jews who reject secular culture), but the lack of English text makes it cryptic. A large asifa to protest the drafting of bnei yeshiva in Eretz Yisroel into the Israeli army that had been set to take place this month will instead be held on Sunday, 17 Sivan/June 11, at the Barclays Center in Downtown Brooklyn, NY. So attendees at a big gathering will protest an apparent change of policy that will make it much more difficult for traditional Orthodox Jewish students--both Hasidic (who follow a rebbe) and non-Hasidic (who don't)--to get deferments from the draft. Comments on the Yeshiva World website explain some of the debate. The Fordham Urban Law Journal hosted a debate between NYU Professor Roderick Hills and Ilya Somin on the eminent domain decisions by the New York Court of Appeals in the cases of Atlantic Yards (aka Goldstein) and Columbia University (aka Kaur). Somin's 2011 article “Let there Be Blight”, which I covered here and here, argued that these takings violated both the New York state and federal constitutions, especially, he said, because of the contrast between the court’s broad definition of blight and the state constitutional provision limiting blight condemnations to “substandard and unsanitary areas.” Hills responded with a critique and Somin posted a reply. Prokhorov's company announces start of LIU Paramount Theatre renovation in fall, should open "before 2019"
The renovation of the Paramount Theatre, at Long Island University and the DeKalb Avenue subway stop in Brooklyn, is moving ahead. (And, as I've observed, that's bad news for the renovated Kings Theatre deeper in Flatbush, which lacks such a good transit connection. The next meeting of the Atlantic Yards Community Development Corporation is coming in ten days. I'm not sure what the agenda will be--there's not much dramatic going on with the project, not that's surfaced publicly--but the most recent meeting, on 3/29/17, was brief and mostly uneventful. Brooklyn, New York 11201 This meeting is open to the public. Web casting of the meeting will be available here. Due to building procedures, those attending should please RSVP by 5:00 p.m. on Monday, June 5, 2017. RSVP press line (800) 260-7313; RSVP public line (212) 803-3766.
what was going on and how long it lasted?whether it will continue?whether it was noticed and, if not, why not? I got a response late yesterday that did not address the lack of notice. The concrete work on the new West Portal tunnel roof was originally scheduled to occur during the day, but was shifted to evening because of a last-minute request from the Long Island Rail Road, so it wouldn't conflict with train operations. One huge, unmentioned irony hung over the presentation last Thursday by the New York City Department of Transportation about upcoming safety improvements to chaotic, perilous Times Plaza--notably new pedestrian islands and concrete neckdowns for those crossing Atlantic and Flatbush avenues--and the subsequent upgrading of the triangular public space. Remember the "Bed-Stuy Boomerang" I uncovered in 2011, which was used to gerrymander an area of high unemployment to enable cheap EB-5 financing from immigrant investors for Atlantic Yards? It shouldn't be a surprise. Like some other real estate developers, the Kushner Companies, builders of two luxury apartment projects in Jersey City and owned by the family of President Trump’s aide and son-in-law, Jared Kushner, have gamed the EB-5 investor visa system, getting their buildings officially located in zones of high unemployment – thanks to creative mapmaking. So, does an "on-demand sommelier" drive 550 Vanderbilt sales? Nah. But it is *in* a neighborhood. All publicity is good publicity, especially when your building comes first in a roundup, but there's a certain incoherence to Curbed's roundup yesterday, headlined In New York’s cutthroat residential market, experiences are the new must-have amenity, and subtitled "Perks like a fitness room and a lounge are no longer enough to lure prospective tenants." While 550 Vanderbilt residents might appreciate a "Neighborhood Partner Program" involving local businesses, like gardening classes and "an on-demand sommelier," it's doubtful that the condo buyers who put down deposits two years ago give a fig. According to the latest Atlantic Yards/Pacific Park Construction Update (bottom), covering the two weeks beginning May 22 and circulated yesterday at 3:45 pm (a bit late) by Empire State Development after preparation by Greenland Forest City Partners, there's not much new work, but some progress in infrastructure for the long-term buildout. Drilling of foundation piles in the area of B5--in the Vanderbilt Yard just east of Sixth Avenue--should be completed during these two weeks. After that, drilling foundation piles in the area of B7 will begin. These are two large sites once projected to start vertical construction in 2023 and 2019, respectively. Also, the site access ramp to the railyard. may be relocated to the western end of the block. I previously reported on how the Church of the Redeemer, on Fourth Avenue catercorner to Site 5 of Atlantic Yards/Pacific Park, sold for $20 million and was demolished. Now, the Real Deal reported 5/17/17, the developer Adam America is "in talks" to buy the site and build a 72-unit, 12-story condo building with commercial space on the ground floor. Does a 12-story building "normalize" the transition from Site 5 to the neighborhood directly south? Somewhat. That said, the already approved Site 5 building, 250 feet tall, would be twice the height of the condo building said to be planned for the church site. The unofficially proposed massive two-tower project at Site 5, involving a shift of bulk from the arena block and a new state plan, could stretch 785 feet, a much more dramatic transition. But expect any new development in that area, including the proposed 80 Flatbush plan to the north, to be used as an argument for something bigger at Site 5. Modern Farmer, the "whopping" garden at 550 Vanderbilt, and the "massive public works project"
But here’s one we haven’t seen much of: Rooftop gardens. That’s right: one gigantic new-construction condominium building in the heart of Brooklyn is making urban agriculture a fundamental part of its pitch. 550 Vanderbilt is a huge 278-unit building in what was formerly called, and probably still best known as, the Atlantic Yards, a massive public works project to transform a defunct train terminal into a commercial and residential zone anchored by the Barclays Center, home of the NBA-worst Brooklyn Nets. Last night, reports of gunshots at the Barclays Center at the end of a show by the rapper Future sparked a real and social media panic, as fans stampeded out, some reportedly bloody. There were no gunshots, the arena and the police said, but there was widespread alarm and dismay among attendees. The Daily News reported, in Loud noise sparks wild stampede at Barclays Center in Brooklyn, "NYPD and FDNY officials said there were no reports of gunfire and no injuries reported." The actual cause of the noise wasn't reported. The fate of a potential massive project at Site 5--floated, but not officially proposed--is again delayed, thanks to an extension of time in the litigation between P.C. Richard, owner of a building on the site, and Forest City Ratner. The electronics store last year sued to stall the planned eminent domain proceeding regarding its store at Site 5, across from the Barclays Center, claiming that original project developer Forest City Ratner promised the company space in the replacement building. Greenland Forest City Partners, now the joint venture developer of Atlantic Yards/Pacific Park, was not sued, but the separate LLC representing Greenland independent of Forest City has been served with a subpoena for a depositions and documents. Tonight, at a 6 pm meeting of the Community Board 2 Transportation Committee--see poster at right--the New York City Department of Transportation (DOT) will discuss a proposal for changes in the design of Times Plaza and safety improvement at the fraught intersection of Flatbush and Atlantic Avenue. The meeting will be held at the second floor gallery of the YWCA, at 30 Third Avenue, just north of Atlantic Avenue. The DOT's portal for the project is here. 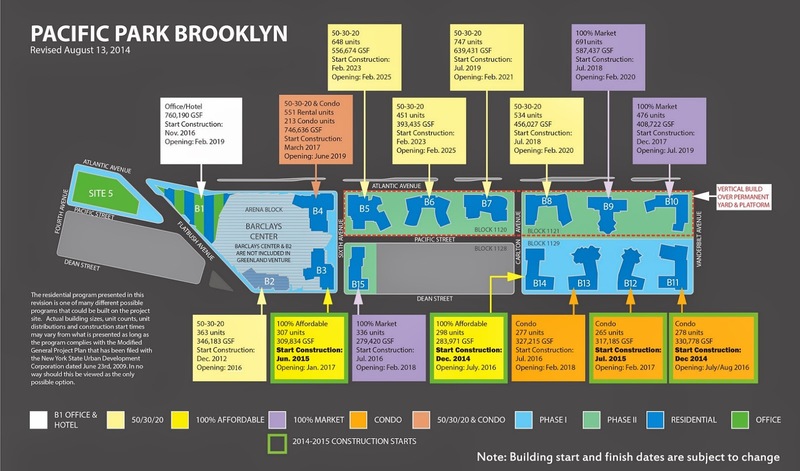 The changes involve not only access to the arena block, but to the planned--but yet unresolved--major construction at Site 5, part of Pacific Park, and the separate proposed project at 80 Flatbush Avenue. If 10,000-plus people come to the Barclays Center and no one from the arena announces it, does anyone notice? On Sunday, May 14, more than 10,000 "practitioners of Falun Dafa, a traditional Chinese spiritual discipline," as described by the Epoch Times, attended the group's annual conference in New York. It culminated at the Barclays Center to hear founder Li Hongzhi, the founder of the group, also known as Falun Gong. Besides the crowd, numerous buses idled outside the arena, on Atlantic and Flatbush avenue, some in bus stops, as described by the neighbor who sent me the pictures. There was also a small counter-protest, I'm told, presumably representing the perspective of the Chinese government, which represses Falun Gong and its members. The event was unmentioned in the Barclays Center calendar circulated to neighbors, though a previous policy was to mention such non-ticketed events. Classic chutzpah: Grand Army Plaza said to be gateway to 550 Vanderbilt backyard! Um, it's half a mile away! OK, the largest number of affordable studio apartments in 100% affordable 535 Carlton will rent for $2,137 a month. One market-rate unit in 461 Dean actually dipped below that threshold, after price cuts, as I wrote in December, and now market-rate units in 550 Vanderbilt, because of the glut, are getting closer: rent for one studio, as shown on StreetEasy, has gone from $2,500 to $2,200. A monthly rent for that apartmentA household income amountThe % of New Yorkers at each AMI levelThe context, for watchers of Atlantic Yard/Pacific Park, is that 50% of the units in two "100% affordable" towers, 535 Carlton and 38 Sixth, is directed to upper middle-income households. Notably, the largest chunk of two-bedroom units at 535 Carlton would rent for $3,223 and at 38 Sixth would rent for $3,206. Last September, I wrote about the low-ball offer of $15.1 million that Empire State Development (ESD), the state authority overseeing/shepherding Atlantic Yards, made in February to P.C. Richard, which owns one of the two buildings at Site 5, across Flatbush Avenue from the Barclays Center. That's well below the value of stated development rights, much less what is currently permitted (or might be permitted in the future) on the property. Of course, as I wrote, in New York eminent domain cases, the condemnor often low-balls owners of the subject property as a way to nudge them into negotiation and a presumably higher payment. As the city considers whether to rezone Gowanus and, perhaps, morph the gritty low-rise industrial area into a hot new neighborhood of residential towers (albeit at a fraction of the height of Manhattan's supertall buildings), DNAinfo reviewed property records along the canal to find out who stands to benefit most from the changes. Investors have poured at least $440 million into buying land on the polluted waterway and more than a third of the properties have changed hands in the past decade, according to an examination of records for the nearly 130 properties along the 1.8-mile canal. While the single largest landowner is developer Property Markets Group, other landowners include Kushner Companies, Alloy Development, Two Trees, and Forest City New York. Finally, thanks to the high-profile and very dubious effort by the Kushner Companies to raise EB-5 funds in China for One Journal Square, we're getting a flurry of reporting on and commentary regarding the investor visa program. Everyone's piling on, though a few months ago, few in the media were interested--and problems with EB-5 have been evident for years. There have been cycles of brief attention, but nothing sustained. The media attention is important, because typical coverage--see this pre-Kushner article in the Commercial Observer--concerns a narrow range of industry players, interested perhaps in belated reforms but not the fundamental nature of the program. Given EB-5's concentrated benefits and diffuse costs, few represent the public interest, so media attention helps right the balance.